Mezzosoprano Pauline Garcia was the daughter of tenor Manuel del Pópulo Vicente García and the younger sister of the singer Maria Malibran. She was taught the piano by the young Franz Liszt and also studied with Anton Reicha. Her mother wanted her to concetrate on singing and reluctantly she gave up the piano. In 1837 she gave her first performance in Brussels and in 1839 she joined the Italian opera in London where she impressed her public immediately. In 1840 she married the French author Louis Viardot who was twenty-one years older than she was. She had been courted by Alfred de Musset, but Viardot offered a more stable financial perspective. Even it was a marriage of convenience, Viardot was be devoted to her and her children. Pauline spoke French, Italian, Spanish, English, German and Russian and wrote many songs. She also authored several operetta's, among them "L'Ogre" (1868). George Sand turned her into the hero of her novel "Consuelo" (1843). In 1863 she left the stage and left France for Baden-Baden in Germany because of her husband's public opposition to Napoleon III. In 1870 she sang at the first public performance of the Alto Rhapsody by Johannes Brahms on his specific request. After the fall of Napoleon III she settled as a vocal teacher in Paris in 1871. She was very close with Ivan Turgenjev, who often lived near the Viardots. It is unclear if they were ever lovers but Pauline was certainly his muse. 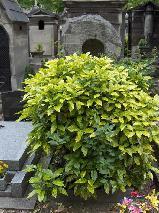 The grave of Pauline Viardot-Garcia and Louis Viardot at Montmarte Cimetière, Paris.